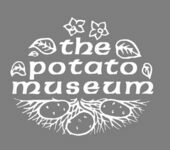 Contemporary Potato Art, starring our favorite tuber---This Potato Revolution exhibition, organized by spud-loving artist/professor Jeffrey Allan Price,was on display in Brooklyn this fall. Those involved would like this conceptual art interpretation of the potato to travel to other venues. Plastics from potatoes! Yes--degrade/compost away. Plastics from Potatoes from Richard East on Vimeo. Check out our founding site here.